Mandalay Bay – bigger rooms with an amazing beach and pool area. They have a wave pool and lazy river. Trump International Hotel -non smoking facility (no casino). They have a program called Trump Kids – coloring books, tear free bath amenities, board games and much more. They even offer babysitting/childcare! MGM Grand Hotel – has one of the most amazing pool areas in Vegas which includes caves, a lazy river, and more. They also have an arcade and is home to the Rainforest Cafe. We went to Vegas when A was 6 months, 18 months, and 2 years old. My favorite time so far has been our last trip because she seemed to enjoy herself more than the other times when she was younger. At 6 months, we basically came to Vegas to look at Christmas decorations and eat. There wasn’t that much for her to do because she was young, I was still breastfeeding, and she had to have her two naps. 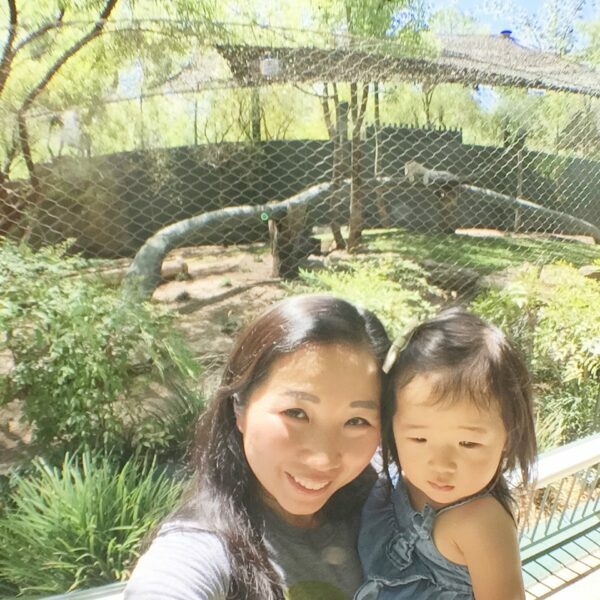 Our most recent trip at 2 years old was the most fun because she enjoyed everything and we were able to do more together. Here are some of the activities we did the other two times we went. 1. Mandalay Bay Shark Reef – The Shark Reef Aquarium at the Mandalay Bay Hotel is home to over 2,000 animals in over 1.6 million gallons of water. There are about 15 different species of sharks as well as piranhas and crocodiles. It costs $20 per adults, $14 for children 4-12 years old and children 3 and under are free. I took A when she was 18 months old and she did not like it very much. It was too dark inside for her liking, but I loved it. I think if I took her at 2 years old, she would have liked it a lot more. 2. Container Park – located in Downtown Las Vegas, this outdoor shopping center has many boutique shops, unique restaurants, and entertainment on the main stage. They also have a big play area in the middle called the Children’s Tree House and Play Zone with a treehouse, slide, and plenty of things for kids to play with. We went when it was 106 degrees out so we didn’t play in that area because it was too hot, but we did play with some giant lego pieces which were by the stage under the shade. It would be a fun place to come when it is cooler for the kids, but a nice eclectic place to explore for lunch or dinner any time of the year. 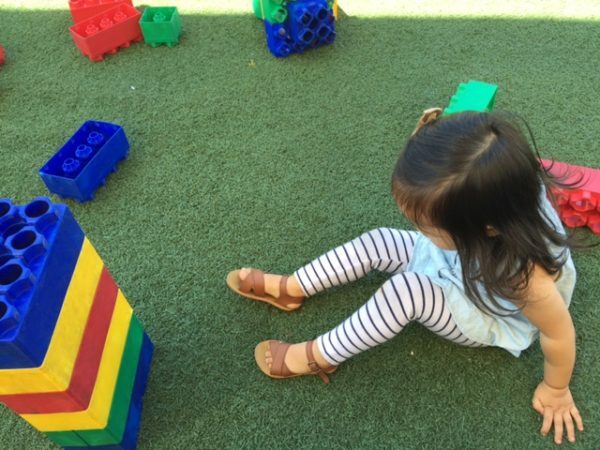 A’s favorite things to do at the Container Park. 3. Siegfried and Roy’s Secret Garden and Dolphin Habitat – Located at the Mirage Hotel is the famous Siegfried and Roy’s Secret Garden and Dolphin Habitat. I took A while hubby had to do some work and we had a great time. It costs $22/ adult, $17/children 4-12 years old and kids 3 and under are free. It is a self-guided tour so you are free to explore at your leisure. We really liked watching the dolphins jump in and out of the water. There’s an underground viewing area to watch them as well. We went when it was hot so the animals in the secret garden were lounging around and sleeping, except the white tiger that was hamming it up for guests. The tiger is lounging in the background! 4. 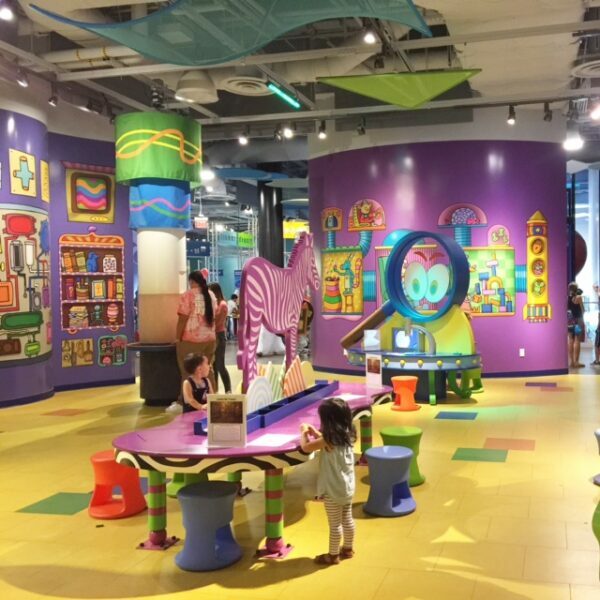 Discovery Children’s Museum – This was probably our favorite place to go with A. It is such an amazing children’s museum located about 15 minutes off the strip. It’s close to the Las Vegas Premium outlets so you can shop while your husband takes your kids to the museum! We especially loved the art room where we decorated a piece of cardboard to make into our very own puzzle. They even had an area just for younger toddlers with a little crawl space for crawlers. This hands-on museum has something for everyone and is definitely a place we will visit again! I went into more detail about our experience at the museum in this post. 5. Town Square – Another outdoor shopping area with a gated children’s park for kids to play. It has a splash pad, a maze, treehouse, slides, and more. We didn’t get to go here but this is on our list of places to visit the next time we go to Vegas. 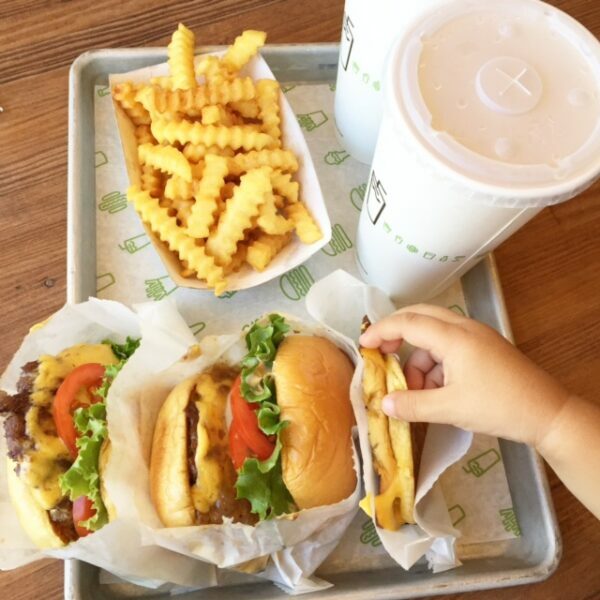 There are so many restaurants to eat at in Vegas – the choices are endless! We always go to at least one buffet. 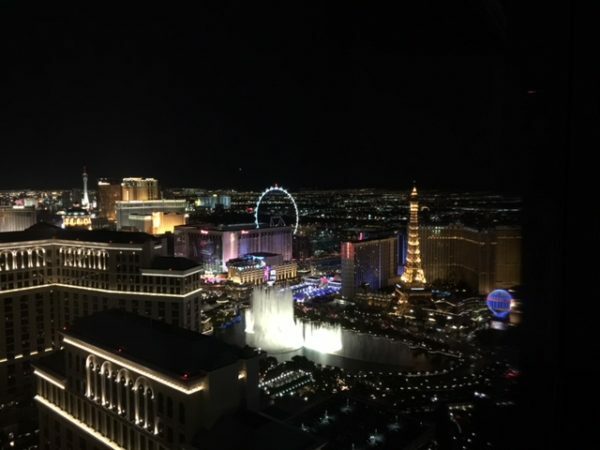 My favorites are Wicked Spoon at the Cosmopolitan, Bacchanal Buffet at Caesar’s Palace, or Bellagio Buffet. Some other favorite places to eat are Secret Pizza at the Cosmo, Shake Shack at New York New York, and Lotus of Siamoff the Strip. The food is so amazing! Have you ever been to Vegas as a family? What were some of your favorite things to do there? We’ve been to Vegas but not with the kids yet! Can’t wait to take them soon!! You guys will have so much fun! I loved going there with A– just stayed away from the crazies. LOL. Such a great post! I used to live in Vegas and with several small children we certainly frequented many of these places. It can be so hard to know what to do in Vegas with kids. I know! I never knew there was so much that you could do with kids. Thanks for reading! 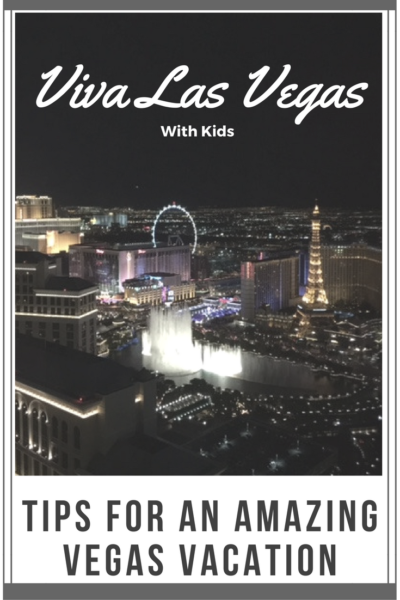 We are heading to Vegas in January and though we don’t have kids I am a huge kids at heart, so this is a super helpful post!! Thanks for sharing! Thanks so much ! I’ll totally link up my post to your site later. Thank you! I hope you have a blast on your Vegas vacation!! SO FUN! I want to go to Vegas, but honestly can’t imagine leaving my toddler. Good to know we can all have fun! Yes! There’s so much you can do with your family. If you don’t have a car, you can always take an Uber or cab to the different areas. How fun! L will LOVE the children’s museum. I wish we had one like that here in California. I love this! I never thought of Vegas as being family friendly but this makes me want to take my kids there too! So cool that we both wrote about Vegas. We enjoyed our trip.Great tips here. Thanks for your perspective! I’ve always wondered if bringing kids to Vegas was doable! Such a great, helpful list! I am going to try and make it to Siegfried & Roy’s Secret Garden and Town Square next month! Both sound so fun! We love vegas and go every year! There is so much to do! It’s great for all ages! This list is great! I have been to Vegas a few times but never with the kids. I think they would really love it!